Ankle X-rays are presented here in two views. What are X-rays of the Ankle? X-rays of the ankle pass through skin and soft tissue mostly, but do not pass through bone or metal easily. As different tissues in the body absorb different amounts of radiation, the images will show different shades of black and white. One of the most common uses of an ankle X-ray is to check for broken bones after an accident, but they are also used under many other circumstances. X-rays are used for a multitude of reasons. A physician may order an X-ray to check for certain cancers in different parts of the ankle by detecting abnormal tumors, growths or lumps. An X-ray is used to view the area of the ankle where a patient is experiencing pain, swelling, or other abnormalities. The ankle X-ray can help a physician find a cause for those occuring problems. 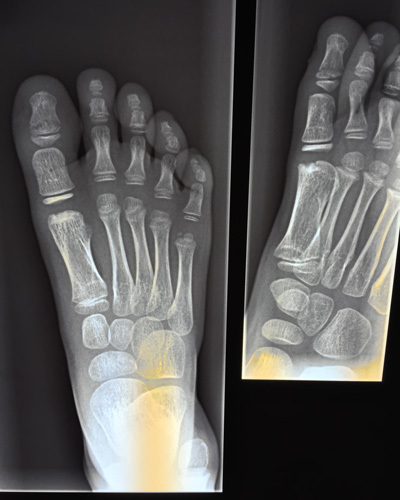 Ankle X-rays can be used to diagnose a disease, monitor the progression of a disease, determine a treatment plan, and see the effect of a treatment plan. Physicians use ankle X-rays to locate foreign objects in that area and to guide them in setting broken bones. X-rays of the ankles are used to determine the cause of symptoms such as pain, tenderness, swelling or a deformity of the arm. An ankle X-ray can detect infection, cysts, or tumors in the ankle. An ankle X-ray can detect broken bones, assist a physician in setting the broken bone, and can monitor the treatment process to determine whether the bone is properly aligned and the break is healing properly. Ankle X-rays are used in pre-surgical planning and are used post-surgery to assess the results of the surgery. 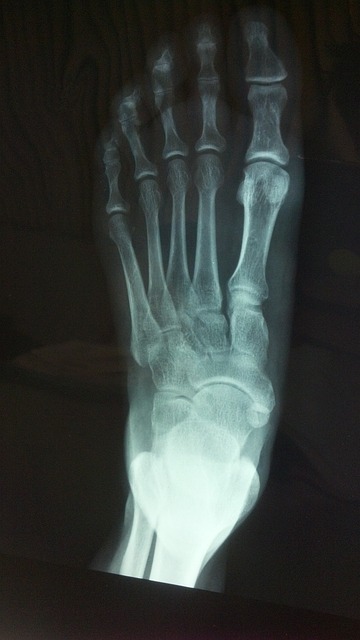 ABOVE: X-ray of broken ankle after repair. ABOVE: X-ray of fractured ankle with two screws after repair.